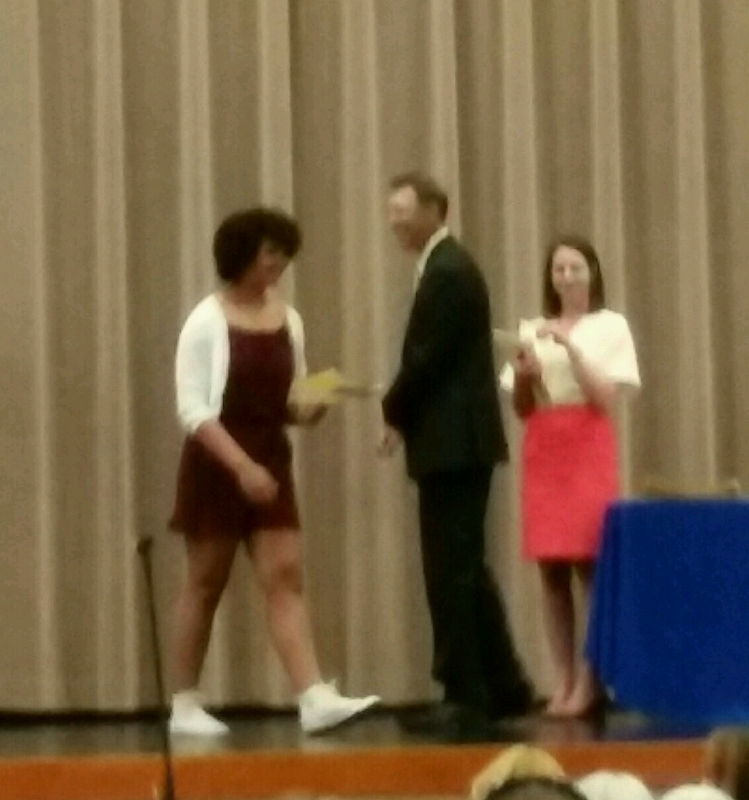 And so, Anah has moved on from Middle School to High School in the fall. As it is with such things, the time has flown by and it seems she should still be a babe in arms. I'm sure that's just wishful thinking, teenagers aren't nearly as much fun as little ones. But as teens go, she's a good egg. 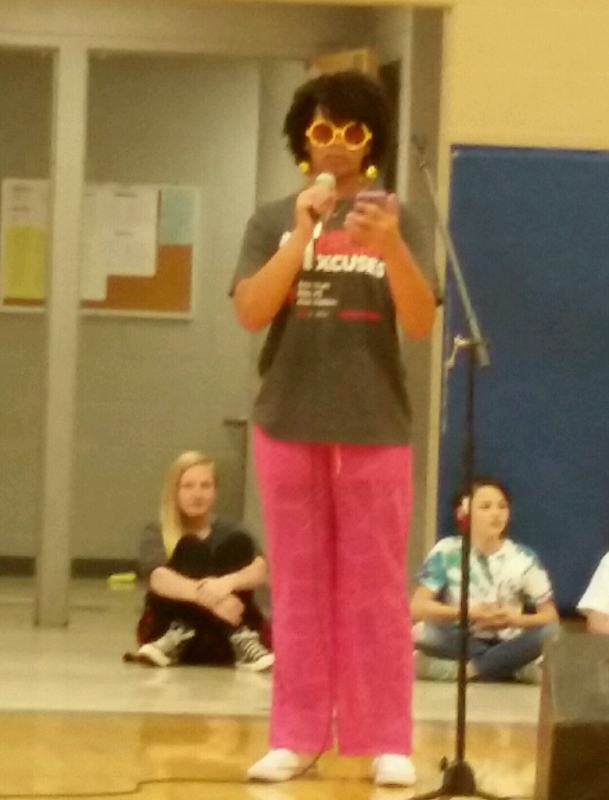 She was emcee for the annual talent show and did a great job, like she had held a mic in her hand forever, no quavering voice, no mistakes. Friday was Awards Day and she raked in 6 awards plus (I think her favorite) a $20 bonus for being tops in Social Studies. This weekend is filled with parties, lunches and other celebrations with her friends. Next week she starts daycare for Tai, her 10 yr old cousin. That should be quite interesting and hopefully foster her growing maturity. 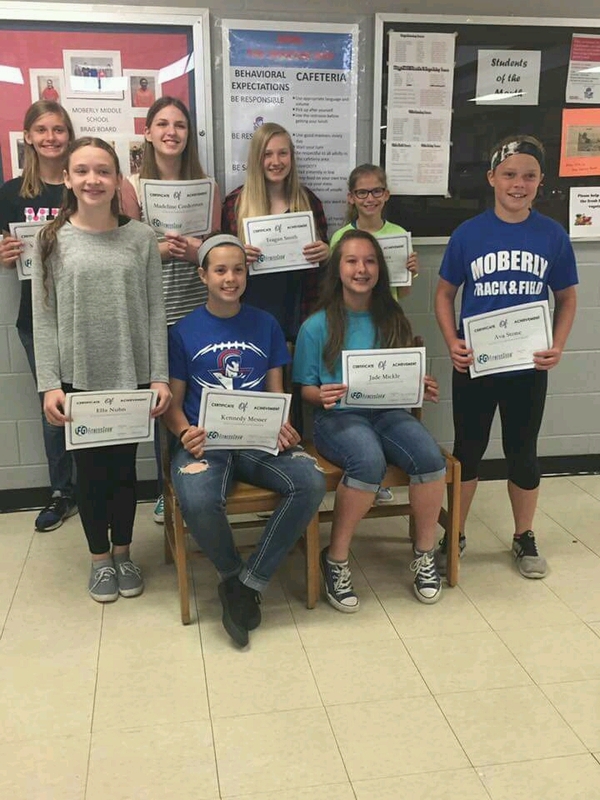 Jade (front row right seated) won two awards and moves up to 7th grade. She's much quieter than Anah, but does extremely well in sports. The youngest, a great grandchild, moves to a new school for grades 3, 4, & 5. Wednesday was luncheon day. I made it easy and used up all the leftovers from Mother's Day, so there wasn't much to do. Thursday found me lying around. The chairs that we were forced to sit in to watch the talent show had wrecked my back, even though I took my cushion. They really were awful, hard plastic with very straight backs. The husband only made it halfway through before he had to go stand up for the duration. I enjoyed sleeping, reading and in general just vegging out. It was a rainy day which made it much easier to just rest. Yesterday it rained again, a real downpour, but during the breaks I did get a few plants repotted. I'll be glad when that chore is done. I have truly 100's of aloes that I have no idea what to do with, but hate to just compost them. Erin wants some saved for her rock garden. They are currently languishing in the potting sink. I broke a huge arm off the giant one which did not make me happy. I am at a loss as to how to get it out of the pot and how to make it upright again as it leaned to the light when it was outdoors and looks weird. I may not bring in the succulents again. They are great in the summer as they don't require a lot of care, but are not happy campers when they come in. Still cloudy today and would like to get the rosemary and the giant jade outside, but not sure if the husband is up for that. They require a dolly and more strength than I can muster. Also plans are to go to Erin's and assemble the shelf unit for her garage and her desk. Daughter #2 is coming to help, should be somewhat comedic as none of us really know what we are doing. Usually the husband wanders down just to see how badly we are screwing up and then ends up doing the work. Of course, we can't count on that, time will tell. Came home from town on Thursday and the most adorable black kitten was sitting on the garden bench. He was so friendly and cute that for a moment I was enamored. But I already have 3 cats and that large not so friendly dog so quickly dismissed any idea of bringing him in. After our earlier experience of the neighbor's dog killing another kitten we liked, Erin and Anah decided to adopt this one and add it to their menagerie. What a relief. Anah named him Bagheera. I was pretty sure they would fall in love with him as he resembled their cat who died last year so very glad that they did and he is now safely inside. Almost time to go muck about in the wetness and see if there is more asparagus to cut. The rain seems to have stopped. There may be a few strawberries as well though they have not been prolific this year. The pool is now ready and if we get some sun might just be warm enough for the younger ones to go swimming tomorrow. They don't seem to mind the chill. Me, I'll be lucky if I get in before July. That tongue! Congrats to all the kids on what sounds like a very successful year. That's horrible about the neighbor's dog. But I'm glad this kitten has found a good home. I have a weakness for black cats. What remarkable grandkids you have! Beautiful grand-daughters! Time most certainly does fly. 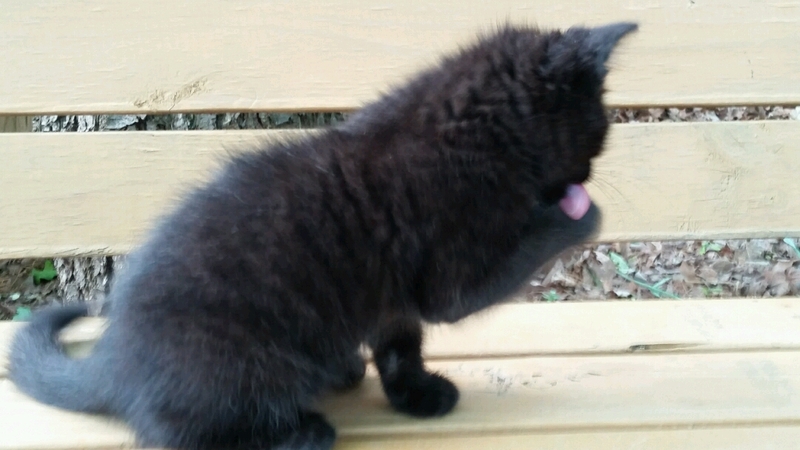 If I saw a cutie pie kitten like Bagheera I would not be able to resist bringing him home!